Globalist trash Mitt Romney took a shot at President Trump in a Washington Post op-ed just two days before he is set to be sworn in to the Senate. Over the years, Mitt Romney has criticized Trump’s stance on immigration and he really stepped up his attacks after Trump passed him over for Secretary of State. Now Romney is taking a shot at Trump just days before he’s sworn in to replace outgoing Utah Senator Orrin Hatch. “The Trump presidency made a deep descent in December,” Romney began his op-ed before going into a diatribe about Trump ‘abandoning his allies’ because he pulled out of Syria. Romney praised the Trump-hating globalists who used to work for President Trump. Every person he listed has since been fired or resigned — he even praised Jeff Sessions who did more to destroy Trump’s presidency than any other person. In the penultimate paragraph of his op-ed, Romney echoed outgoing RINO Jeff Flake and vowed to speak out against ‘racist, sexist, anti-immigrant’ statements or actions.’ Remember, Mitt Romney has binders full of women! He’s not sexist! Mitt Romney will replace globalist, Trump-hating RINOs like Jeff Flake and the late John McCain. 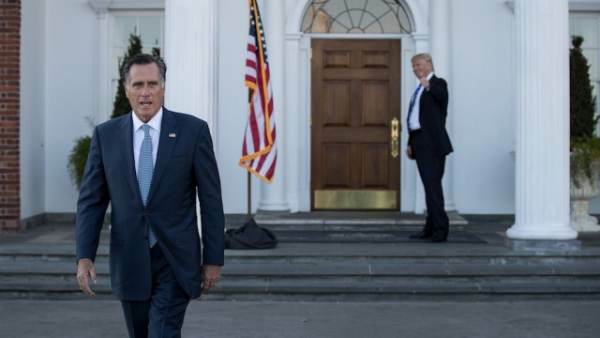 President Trump tried to extend an olive branch to Mitt Romney and endorsed him in the Utah Senate race in February, but just like every other globalist, establishment elitist, there is nothing Trump can do to win his favor.